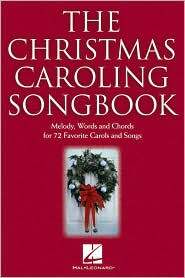 This handy collection gathers over 70 holiday favorites that are perfect for caroling or Christmas parties. Songs include: Auld Lang Syne . Away in a Manger · Carol of the Bells · The Christmas Song (Chestnuts Roasting on an Open Fire) · Deck the Hall · Feliz Navidad · Frosty the Snow Man · Happy Holiday · (There's No Place Like) Home for the Holidays · My Favorite Things · Rockin' Around the Christmas Tree · Silent Night · We Wish You a Merry Christmas · and more. Blue Christmas * Caroling, Caroling * The Christmas Song (Chestnuts Roasting on an Open Fire) * Christmas Time Is Here * Do You Hear What I Hear * Fairytale of New York * Feliz Navidad * Frosty the Snow Man * Grown-Up Christmas List * Happy Xmas (War Is Over) * Have Yourself a Merry Little Christmas * Here Comes Santa Claus (Right down Santa Claus Lane) * A Holly Jolly Christmas * (There's No Place Like) Home for the Holidays * I Heard the Bells on Christmas Day * I Saw Mommy Kissing Santa Claus * I'll Be Home for Christmas * It's Beginning to Look like Christmas * Jingle Bell Rock * Joy to the World * Last Christmas * Let It Snow! Let It Snow! Let It Snow! * The Little Drummer Boy * A Marshmallow World * Merry Christmas, Darling * Mistletoe and Holly * The Most Wonderful Time of the Year * O Come, All Ye Faithful (Adeste Fideles) * O Holy Night * Rockin' Around the Christmas Tree * Rudolph the Red-Nosed Reindeer * Santa Baby * Santa Claus Is Comin' to Town * Silver Bells * Sleigh Ride * We Need a Little Christmas * We Wish You a Merry Christmas * White Christmas * Winter Wonderland * Wonderful Christmastime * and more. .
Hal Leonard, $24.95, ISBN-13: 9780793585410, 250 songs,232pp Sep '15. This outstanding collection features 200 Christmas, Chanukah, and New Year's holiday songs, dances, and instrumental selections from more than 40 nations and cultures world-wide, including a sizable section of songs with non-English lyrics. The 20 Chanukah songs alone represent the largest collection of their kind in print today. Each tune is shown as a simple melodic line with chord symbols and lyrics. The book also includes accompaniment patterns, keyboard arranging guidelines, sample arrangements, and a special chord reference chart to enable even the novice pianist to create tasteful and beautiful settings. Angels from the Realms of Glory * Birthday of a King * Deck the Halls * Have Yourself a Merry Little Christmas * I'll Be Home for Christmas * It's the Most Wonderful Time of the Year * Joy to the World * We Wish You a Merry Christmas and more. "C" edition. Alfred Pub, $10.95, 153 songs, 116pp, Jun '95. 120 of the most requested Christmas songs. Also features spiral comb bound binding, an extensive introduction with helpful hints on interpreting chord symbols, more. The Chipmunk Song · Feliz Navidad · Frosty the Snow Man · Happy Holiday · A Holly Jolly Christmas · Home for the Holidays · I'll Be Home for Christmas · My Favorite Things · Rudolph the Red-Nosed Reindeer · Suzy Snowflake more! Auld Lang Syne * Blue Christmas * The Christmas Song * Frosty the Snow Man * The Greatest Gift of All * Happy Hanukkah, My Friend * Happy Holiday * Home for the Holidays * I'll Be Home for Christmas * It Came Upon the Midnight Clear * It's Just Another New Year's Eve * Mary Had a Baby * O Holy Night * Rudolph the Red-Nosed Reindeer * Silent Night * Tennessee Christmas * We Need a Little Christmas * more! 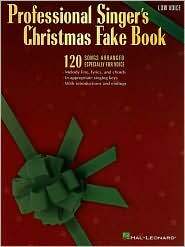 Professional arrangements of favorite standards in an easy-to-read fakebook format. 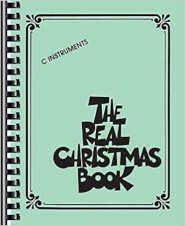 This book adds interest and excitement to Christmas classics through the use of chord substitutions, printed in red above the original chords. Playing tips, introductions, and endings are included for many of the songs. 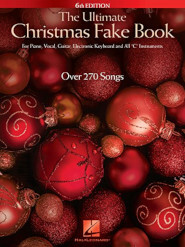 Over 70 songs including: Angels We Have Heard on High · Away in a Manger · The Christmas Song (Chestnuts Roasting on an Open Fire) · Frosty the Snow Man · O Holy Night · and more. And Suddenly It's Christmas · Away in a Manger · The Chipmunk Song · The Christmas Shoes · The Christmas Song · Christmas Time Is Here · Coventry Carol · Deck the Hall · Do They Know It's Christmas? · Feliz Navidad · Frosty the Snow Man · I'll Be Home for Christmas · Joy to the World · Pretty Paper · Rudolph the Red-Nosed Reindeer · Silent Night · Silver Bells · Still, Still, Still · Sussex Carol · Wassail, Wassail · Who Would Imagine a King · Winds Through the Olive Trees · and more. This page updated on March 29, 2019 .